Coerced by a domineering father into marrying a man she does not love prompts Long Island, New York heiress Sara Carleton to run away and board a train heading to the West Coast. On an unscheduled stop in Red Rock, Colorado, fate intervenes when she is mugged in a dark alley. Rancher Jackson Phillips doesn’t mind helping the attractive mugging victim he and his sister rescued at the train station, but having her come to his ranch to recuperate turns out to be much more than he bargained for. “A refreshingly sweet tale.” 4 stars. Romantic Times. “An enjoyable read.” Night Owl Reviews. “A modern Western, packed with secrets, intrigue and old-fashioned romance. 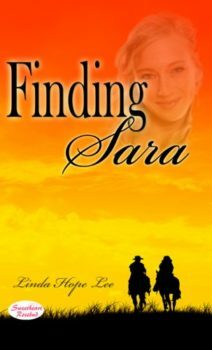 FINDING SARA is a story that won’t be forgotten.” Joanne Hall, Writers and Readers of Distinctive Fiction. “Lee takes a cowboy and an heiress and combines them into a refreshingly sweet tale. Readers can easily relate to the main characters as Sara searches for herself while Jackson overcomes a devastating loss.” 4 stars. Karen Sweeny-Justice, Romantic Times.